The call of, “Come see! A frog!” is one oft repeated in the Hendershot household from spring through fall as toads go by both names – toad and/or frog. So the other morning when Izzy called to, ”Come see this frog!” I was expecting another toad. But when I walked to the front door, there on one of the glass panes next to the door was a treefrog – round saucer toes keeping it firmly planted on the glass. The amphibian attached to those large saucer toes was about 1.5 inches long. It was a light greenish-gray on top with grayer sides. I am thinking, from distribution maps that it was a Cope’s gray treefrog. There are two species of gray treefrogs, Hyla chrysoscelis (Cope’s) and Hyla versicolor (common gray or eastern gray.) Now there are other species of treefrogs that are gray in coloration, like bird-voiced and occasionally the pine woods treefrog but these are the two “gray” treefrogs. As far as I know, the two can’t be distinguished by sight. Herpetologists that handle both regularly may have a clue, but I know I don’t and the references I checked said there’s no way. They are easily discernable by call. Cope’s has a harsh, metallic, rapid trill while the common gray’s call is slower and a bit more melodic. 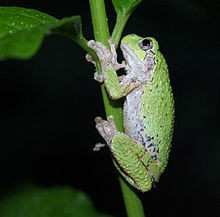 Just Google gray treefrog calls on the Internet and you will get any number of sites where you can compare the calls. Range maps I found for the two species in North Carolina noted that Cope’s gray treefrog was widespread throughout the state but the common gray treefrog was recorded only from Warren and Caswell Counties on the North Carolina – Virginia border. Since I don’t recall hearing any treefrogs recently, I am assuming, based on distribution that our visitor was a Cope’s. Cope’s and common gray treefrogs can be told from bird-voiced treefrogs, in the field, by the bright orange coloration on the underside of each hind leg. This coloration is usually seen as a bright orange flash when the frog hops and is thought to have evolved as a way to distract predators. The two gray treefrogs can be told apart in the lab by the number of chromosomes. The common gray treefrog has an extra set of chromosomes (48) and is known as the Tetraploid Gray Treefrog while the Cope’s has 24 chromosomes and is known as the Diploid Gray Treefrog. Biologists believe the tetraploid frog is a descendant of the diploid. Gray treefrogs are pretty solitary critters. They are primarily arboreal and nocturnal coming out at night to feed on insects and small invertebrates – or climbing up the glass next to our front door, foraging for insects attracted to the light. You don’t hear large choruses of them singing together like you do with spring peepers. Small choruses of maybe a couple of dozen may be heard occasionally in prime habitat during the peak of mating season. And the peak of mating season may be sometime between April and August depending on location. It is generally thought to occur between May and June in North Carolina. The species name of the common gray treefrog, versicolor, attests to the fact that these frogs change color for camouflage. We put the little critter Izzy found the other morning on the back deck under the flower boxes hoping it would hang around till Maddie awakened. It did, and we showed it to her and went about our business. Maybe an hour or so later Maddie came in with cupped hands announcing that she had caught “another” frog. She opened her hands and there was a frog almost totally green and a lighter shade of green than the “first” frog. In fact, it was almost the exact same shade of green as the siding of the house – and Maddie found it just where the “other” frog had been.